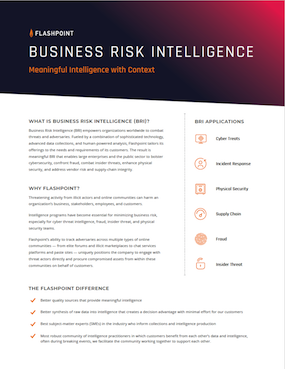 Flashpoint - Business Risk Intelligence from the Deep and Dark Web. Cybercrime, emerging malware, zero-day exploits, and hacktivism are only a few of the threats from which cyber threat intelligence (CTI) teams must protect their organizations. Having spent years arming CTI teams in the fight against cyber threats, we tailor our offerings to CTI needs, challenges and objectives. Safeguarding company personnel, assets, and infrastructure from physical threats posed by adversaries ranging from insiders and hacktivists to violent extremists is inherently challenging and resource-intensive. Having spent years bolstering security across all sectors, Flashpoint tailors its offerings to corporate & physical security teams’ needs, challenges, and objectives. Today’s fraud teams require highly specific resources in order to operate effectively. Given that their responsibilities include combating data theft, safeguarding assets, and keeping up with fraudsters’ ever-evolving tactics, they need solutions that can operate across all sectors. Having spent years supporting anti-fraud efforts across multiple areas, Flashpoint offerings are tailored to fraud teams’ needs, challenges, and objectives.